In the fall of 1996, I started getting interesting in marquetry, just as reason to build a CNC router. In February 1997 I started Inlay.com, with the hopes of learning more about marquetry, inlay, and mosaics in general. I built a homemade CNC router, it was neat, but its performance was lack luster. I almost took a job that involved programming a CNC waterjet, but that fell though; I was a bit greedy on my salary, live and learn! All along, people were telling me from time to time, to check out lasers to see how they can be used in the craft, but I just never looked into it. 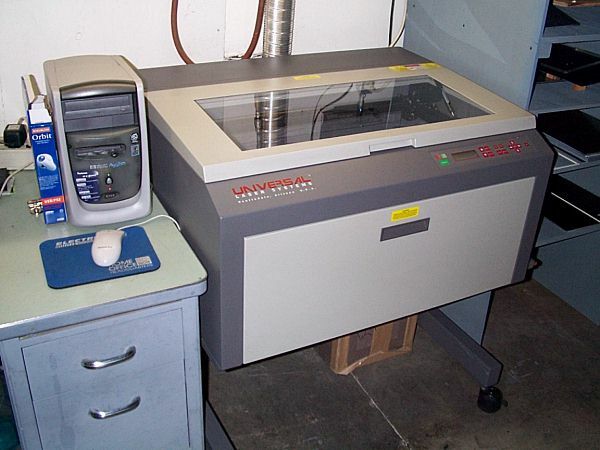 In summer of 2000, I started work at a company that had a 50-watt laser engraving, cutting machine. In all honesty, the laser was one of the biggest job benefits. I actually started at the company, without seeing it first. Now I have to fill you in a little, I have been in many shops that have industrial lasers. The large industrial lasers are like 3000 watts, and can cut one inch (2.5CM) thick stainless steel. They have the ability to turn a full 1/2" (1.3CM) sheet of plywood into shreds, in minutes. This laser just does not have the gusto to pull a stunt like that off. So this was part of my job, to program this machine, that I had never seen. I knew the company used it to cut out, and engrave plastic panels, and thick paper, but I still had the idea in my head of a truck-sized machine. This machine is about the size of a standup copier. The first time I seen it I was rather disappointed. That only lasted a few minutes. I was awed and memorized by the way it cut! It was a useful machine after all. 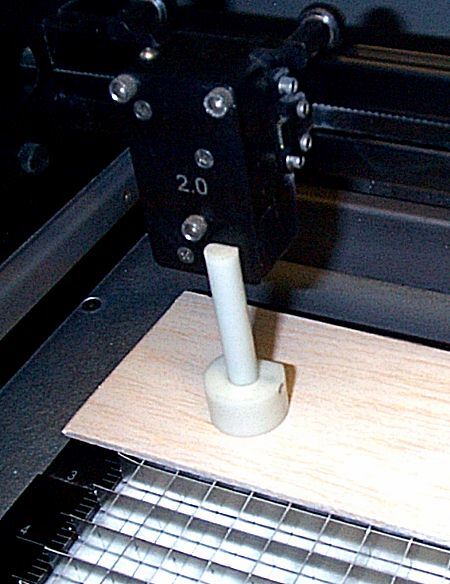 With a CNC router, one has to hold down the material so it doesn't move while cutting. 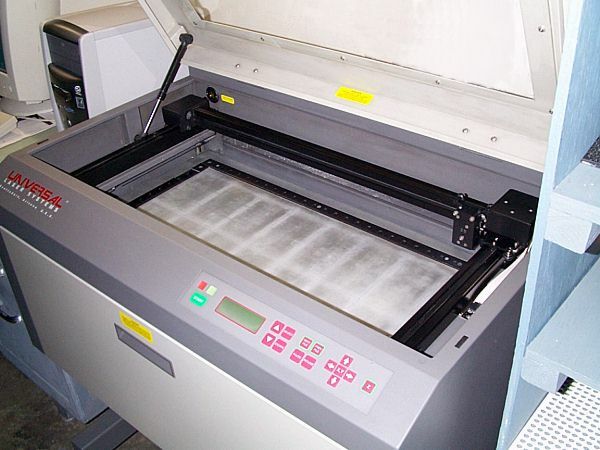 In a laser cutting machine if you follow a few simple rules, no hold-downs are required. You do have to worry about pieces moving after they are cut a little, but still this is much, much easier, then a rotary machine. How it works is quite simple. In the back of the machine, there is a 50-watt CO2 laser tube. There are mirrors and lenses, which get the laser beam, to the yellow lens at point 1 in the picture below. At point 2 there is a right angle mirror, that redirects the beam to point 3. At point 3, there is another right angle mirror that points the beam downward. Along with the mirror, there is a lens that focuses the beam to point 4. The lens that I used had a two-inch focusing distance. You can see there are 3 screws at point 3; the right angle mirror, and lens assembly comes out for cleaning. I don't know why, but I was surprised that the laser beam was not enclosed in its travels. You can see from the top picture on this page, that the user is protected from the working compartment, by the top lid of the machine. The window is coated to protect the user's eyes from stray laser light. The beam is moved around by 2 slides. The Y slide is the beam that is between point 2 and point Y. It travels on rollers at points 2 and Y. You can see these rollers at point Y. So this bar travels back and forth, from the front of the machine to the back. Gezz this sounds so dry and technical! Anyway, the lens assembly, or laser head, at point 3, is the X-axis. It travels from left to right, on rollers at point X. These two slides are move with cogged belts, which are moved with stepper motors. The bed of the machine travels up and down on four lead screws. One of them can be seen at point Z. These four lead screws are powered by cogged belts that are all powered by one stepper motor. The reason the table moves up and down is so you can focus materials of different thicknesses. The bed of the machine will go down 8 inches, in case you had something 8 inches thick to be cut or engraved. This comes in handy if you wanted to engrave a trophy, or the back of your boom box. This machine was made by Universal Laser Systems. These guys really got their stuff together. The machine is pretty darn easy to use. It's just like a printer. If you are experienced with it you can draw something simple (3-4 objects), and cut it, all in less then 3 minutes. I was using it like a bandsaw or drill press. Walk up to it, cut something, and walk away! Plus it's accurate down to a thousand of an inch. I really miss it now that I can't use it anymore, as I left the company that had it, opps. This laser has a working area of 12" by 24" inches. I am used to G codes, so I think it's a little corny on how it's programmed, but it works great. Your computer thinks it's a printer, the machine came with Windows printer drivers. So from any program you can program this machine. Normally I used a vector based drawing program such as AutoCAD or Corel. I used Corel the most. The laser has 2 modes of cutting, vector and raster modes. Vector cutting is point to point, this being traditional for a CNC machine. Rastering on the other hand is used for engraving purposes. In this mode it works like a dot matrix printer. The laser head moves back and forth to cut a picture, one line at a time. The laser pulses on and off to form the picture. So when the machine receives a file, lines that are under 4 thousands of an inch thick are vector cut. Lines over 4 thousands are rastered. So if you were to print a text document to the machine it would just engrave it. You can set the power so low that it will engrave paper without cutting though it. This brings a whole new meaning to words "laser printing"! Learning how to use the Machine. For me cutting and rastering on the laser had its challenges. It not something that you learn how to do in a book at the library! It took a lot of experimenting, but I finally got the hang of it. It does take a while to learn all the factors, for your cuts to be perfect, and repeatable. On some materials I didn't even know what was possible. There are many factors in using a laser, I would suggest playing with them all, you never know how success is going to arrive! Lasers cut by vaporizing the material. The focused beam of the laser only cuts a path the size of a thick human hair, 0.005 inch, leaving vapors and ash to exhaust out the vent. There are exceptions to this. Some plastics are rather gooey when cut, they seem to cut by melting only, and that does not make for the best cut. You can't cut steel on a machine this small, but it also cuts in larger lasers by burning. There are many factors in laser cutting. You really need to experiment with them all, if you want to be proficient at the process. These are the major factors, I am sure there are more small ones that I have not thought of. The power of the laser is simplest factor in cutting. The more power, the deeper you cut, or quicker you can cut. With this laser the power was set in the printer driver. You would send it a drawing and different colors were assigned to different powers. There was like 8 different colors you could send it, each of them being able to be programmed to a different setting. The laser was 50 watts, and you could set the power from 1% to 100%. That said I just normally cut at 100% power and varied the speed of the cut. In really thin materials you cant get away with 100% power, you will burn right though if you are rastering. There were times when I would get my speeds all set up, and then they would not work latter. A part would cut good for the first 5 minutes, and then start to not cut all the way though. There is a simple reason for this, but it took a call to the laser manufacture to find out why. Lasers have more power when first turned on. To compensate for this our machine trickled power to the laser tube to keep it warm at all times. It works, but you have to be aware of it. When you first start the machine, or if the door is standing open, it would cut noticeably deeper. I normally set the laser to cut a little hotter then whats required, because of this. I also set it hotter, to compensate if the lens got dirty. Laser focusing is another way power is affected. Our machine at the tightest focus would burn a .005 (.13mm) kerf. If you are out of focus, you have to burn though more material, and it will take longer. This comes into play when you are cutting thicker materials. The focus point is just that, above and below this point you are out of focus. For materials thinner then a 1/8 of an inch this does not pose a problem. With thicker materials you have to start playing games. One thing you can do is set the focus deeper then the surface of the part. I routinely set the focus 1/16 deeper on 3/16-inch thick material. Another trick you can play is cut one pass, refocus, and cut another pass. Sometimes when cutting you may not want to have a perfect focus. With some plastics you may want to burn a big enough gap, or kerf so the edges don't stick back together when it's done cutting. For quick rastering or for thick lines when vectoring you can set the head out of focus. Sometimes you have warped materials such as veneer. You have to try and figure out the average height of the surface to set the focus. Or in that case you can turn up the power and blow right though it, but you might get horrible edges that way. Remember it's all about imagination, if you can get the machine to do what you want, and it's not hurting the machine, or the part, go for it! In the picture to the right, a focusing tool is shown. The tool came with the machine, and it's quite handy. You can see that the lens in inscribed "2.0". This lens just happens to have a 2-inch focusing length. They make longer and shorter lenses for the machine. The longer lens is less accurate, but has more clearance to work inside parts with varying heights. I am guessing the longer focusing length also comes in handing when you are cutting some nasty materials that splash back up on the lens. The lens for the machine does get dirty, how much depends on what you are cutting. On some materials you can run it almost all day without cleaning it. Other materials, like fiberglass and solid surface counter top material, you have to clean it like every 15 minutes. I am pretty sure they recommend not cutting fiberglass on the machine, it's nasty! Simply knowing the laser power is only half of the equation to cutting, how quickly you move that laser over the material determines how much burning power you are applying to any one spot. It's pretty linear on how it works. If you double the thickness, you have to double the power to cut at the same speed. What speed to cut at really has to be determined by experimentation. The laser burns by not by a steady stream, but by individual pulses. On this laser I could slow down the pulses enough that I could perforate material, kind of like postage stamps. 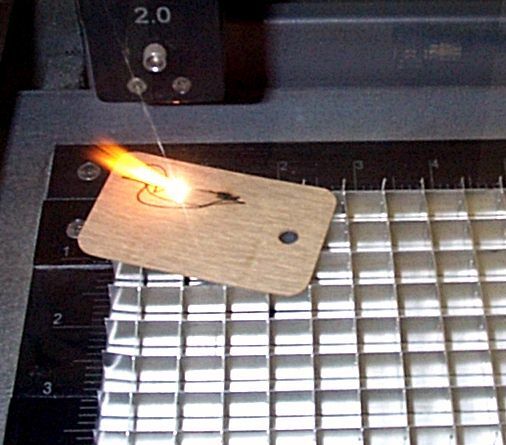 If the laser burns a .005" hole when it cuts, you could make a cut with 200 pules. This would be similar to cutting 10 inches of plywood with 40 1/4 drilled holes. It would cut it, but the edges would be rough. Some materials are like this. I cut paper up at 1000 pulses per inch (PPI). On the other hand, the edge on acrylic melts together when you are cutting it, for this I found a setting of 200 PPI was perfect. This factor is pretty straightforward. The more the passes, the deeper you can go. With the older lasers this was very important. Having a 15 watt machine you have to do like 3 or 4 passes to cut though a 1/8 thick plastic sheet. On some materials such as acrylic, you can only cut so much in one pass, as the laser heats up the surrounding material too much and causes the part to warp. Parts will also warp if you have thinner wall thickness. More passes are required. Some times with materials that have low melting points, you may want to give the material a chance to cool down before hitting it again. If you have too much material in a molten state it's going to glob back together after it cools down. Also with multiple passes you might have to play some focusing tricks, see the focus section. I plan on writing many more articles about different materials that you can cut on the laser. Basically with this low powered machine, if you can burn the material with a match, you can cut it with this machine. The problem comes into play with nasty vapors, residues, and dust. PVC and polycarbonate vapors are down right poisonous. You don't even what to be venting this stuff out to your neighborhood. That said, some laser shops boost their ability to cut polycarbonate! Fiberglass has nasty vapors as well as glass fibers that can mess the precision slides and optics. But cutting it sure comes in handy; you can cut your own circuit boards. Cutting Corian, that is solid surfacing countertop material is really handy. Mostly shops engrave it, then fill it with epoxy. It makes for a beautiful inlay. Again this stuff is nasty because it has bits of rock, grit, glitter, what ever else they toss in there that makes it look so good. All that grit gets into the machine, and you have to clean it more often. So that said, what does it cut nicely? It's a long list. There are plastics that are engineered to be cut with lasers. They have bi and tricolor sign plastics that look oh so nice. Acrylic just rocks on the laser. It cuts with a perfect polished edge, and it does so with like no fumes. When acrylic burns it releases CO2 and water. That's it, plus maybe some modifiers that are in there. A lot of the laser cut-able plastics are a form of modified acrylic. What else? With success I have tried thin polypropylene, polystyrene, ABS, acetate, rubber (a little nasty), Delron, rubber stamps, matting for picture frames, vinyl, labels, stickers, books, junk mail, wood, 2 by 4's, veneer, paper, cardboard, chip board, press board, cork, 1/2 inch MDF, Formica, Fabric, and Fig Newtons. Don't laugh about the Fig Newtons, you can cut them. But Nabisco uses a water jet to cut them! It's the best thing they could come up with; it's sanitary, clean, and just plain cool. I can almost guarantee that the coolness factor weighed in, in the engineer's decision. I bet the lasers were burning the Fig Newtons way too much, who knows. You can etch and distort some surfaces such as glass, marble, and granite. Other materials are made just for engraving such as painted and patinaed brass and aluminum, and anodized aluminum. They have special engravable label materials, the list goes on and on. It really is a versatile machine. It makes pantographs for good anchors. I never tried Styrofoam or wax, but my guess is they both cut great. I don't know about phenolic, polyethylene, and Teflon. Nylon is a no-no. It mostly cuts PETG, but other polyesters, I don't know. PETG is clear, and pretty darn flexible. An 1/8 rod bends a permanent 90-degree turn, without cracking. PETG wants to turn yellow when you cut it; it's a little tough that way. Masking is a poly or paper film that protects a lot of sheet stock while handling. Sometimes it's best keep the masking on, sometimes it's better to take it off. I noticed that with some acrylics, they cut so nice with the poly masking left on. Sometimes you have a choice in masking, as a lot of materials come with a paper or poly mask. I would much rather have a poly mask. You can cut right though it. Plus it's easier to take off, then the paper. The paper masking has an adhesive that goo's up when cutting. It can cause discoloration and all kinds of other funky effects on the edge of the cut. Paper masking is more durable and available though. If you are cutting material that is opaque or will be hidden, you might want to go with a paper masking. Cutting Formica is rather violent in the laser. A flame shots off in one direction, pulled slightly by the exhaust vent. But when cut on the backside, oh does it look nice! There are many ways to support what you are cutting in the laser. The most common is a metal grating material, as seen in the picture. Some people also use a cardboard honeycomb material. You also can cut directly on the bed of the laser, if you are not cutting all the way though the material (rastering). For the most part no hold-downs or clamping is required. For some thin materials such as vinyl or paper, you may have to hold the material so it stays flat and does not curl or warp. Smaller pieces may also have to be held. As in the picture above, this piece of Formica spun as it was being cut. You also have to watch the order in which you cut. For example if you were to cut washers, you would want the inside of the washer to be cut first. When the outside if the washer is cut first, it may move, messing up any latter cuts to the inside. All in all it is a dream to work with a laser compared to a CNC router or milling machine. It's almost inconceivable, you just place the part on the bed and cut, No Hold-Downs or Clamping!!! You can also cut your own grid using the laser. With the metal grid there is some flashback when the beam hits the metal. You can design your own grid to support the sheet where the beam is not going to cut. Another benefit to making your grid is you know that the pieces are not going to fall or shift after they are cut. If you are using a standard grid you may want to change your method of cutting to prevent stray cuts on your parts. You can cut parts with sharing an edge, but sometimes it's worth it to leave a space in between parts so the laser beam does not mess up neighboring pieces. Cutting sheets in the laser is easy. I just placed them in the machine, over the metal grating. I cut the sheet like a 1/2-inch over size, and position it in the center of the cutting area. When the laser is done cutting I am left with a thin skeleton, that I just toss in the trash. You can cut out hundreds custom panels, washers, spacers, etc. from a single sheet. After a while you begin to think in terms of what you can do with different layers cut on the machine. I would love to see a machine like this in an art school, imaginations would run wild. You can see from the pictures on the top of this page that there is a door on the front of the machine. The machines working area is 24 by 12 with that door closed. But you could open it, and work on a sheet that is 24 wide by limitless length. Its comes in handy when you want to engrave the end of a board, or the top of a large panel. One could write a book about using jigs. I will try to cover some of the basics. For individual parts, its nice to use a jig to position the part accurately in the machine. Jigs can be for one piece or hundreds. You can make them out of just about anything, but materials that that cut in the machine are oh so handy. My favorite material for jigs is medium density fiberboard, MDF. It's really cheap, dimensionally stable, strong, it cuts with the laser and standard wood working tools, you can make strong quick joins, with cheap and easily cleaned up wood glue, you can screw it, you can bolt it, you can press fit studs into it, you can even thread it, it's non-conductive, and lastly, I think I it looks good. Am I biased? Not at all. I have also used some plastics namely ABS and acrylic with the same results. Plywood is OK, but it does warp and shrink. Aluminum makes for bulletproof jigs, and it's oh so shiny. Steel is nice, but it does not have to been that strong. These little lasers are great rapid prototyping machines, who wants to spend a week making a steel jig, when its not going to have to put up with that much abuse. One word about metals is they do reflect the light of the laser, not good if you want clean parts. However you can imagine positioning the part, one could build a jig to do it. I relied heavily on the laser to make it's own jigs. Rarely did I use the full accuracy for the parts, so some was lost in the jig, but it did not matter. For some odd reason I like to press fit studs and pins to position parts. Working with MDF and plastics it's so easy to get a tight press fit. You just cut your hole 2-3 thousands of an inch smaller then your pin, and pound the pin in with a hammer. Of course the interference depends on size of the hole. It's so great! What?, you have a 0.383 pin lying around in the scrap bin, just cut a 0.380 hole. Try that with a drill bit! I know you could always pull out a boring head or a special reamer, but heck you have got a laser, go to town! I usually glued the press fit joint just in case. You can press fit un-modified acrylic, but you have to be careful, it will crack easily. Another neat join with the laser, are finger joins. You can make joints that are so solid for jigs, which you don't even have to glue them, but I always do. If pressed pins are too much for your taste; you can always use rails to position parts. The great thing about the laser is if the jig is screwed up, you can always fix it in software! This will come in handy if you have jig designed for multiple parts. Another essential aspect of jig making is GI proofing them. What's GI proofing them? Well you may have different slang or terminology. I say GI because is more popular. I prefer squid proofing, as I was in the US Navy. You could say jarhead proofing. Or you just go with dummy proof; witch is the most self-explanatory. One has to make their jigs so the part goes in only one way, if possible. I will do it just for myself. After running 30-40 parts, my mind starts to drift, thinking about tropical islands and their beautiful swaying palm trees and other swaying assets, and before you know it, I am putting parts in backwards. Enough said about that! A neat trick is to use anodized aluminum on the bed surface. This material absorbs the un-focused laser beam. It is available at any engraving supply house. I paid $7 for a 12 x 24 sheet, that was nice because that's the same size of the laser bed. Both sides of the sheet at anodized. It's easy to cut with nippers or a shear. It's also great for the bottom of jigs. In general it's nice to prevent laser reflection, because it will mess of the back of what you are cutting. It also protects the jig if you made it out of wood or plastic. The bottom of jigs will get cut away if you dont watch it! Air assist on a laser is where a jet of air is directed at the cutting point. Some use inert gases to prevent flaming. Some use oxygen to assist on the cut. This laser had the option of compressed air assist. I really dont know much about this, as I did not get to use it. On the larger machines, it is required. It will give you a cleaner cut and the lens on your laser stays cleaner as well. Nothing says that you have to cut all the though your material. I have successfully used different power settings to make stepped cuts, kind of like using a milling machine and only cutting halfway though. Groves and notches can be done on some materials this way. It really takes some experimentation. I was able to hold a +/- 0.005 tolerance on height, on acrylic. Obviously other materials, like wood, you could never hold the tolerance that close. The machine allowed you to raster in ether the x or y direction, depending on how efficient it was. It defaulted to the x direction, which is handy for normal text, as it is composed of horizontal strips that need to be rastered. If you wanted to raster a bunch of vertical lines, it would save time to set the machine to raster in the Y direction. On this model you could raster different colors in your CAD drawing at the same power settings. Where this came in handy was when you tried to raster two items far apart from each other. If you assigned them the same color, just like with a dot matrix printer, the head travels back and forth to raster each of them. Most of its time is spend moving between them. If you assign them different colors, they will raster separately, thus saving time. Of course better software would cure this problem. This is another item that I have not used. This is great for when you want to engrave round surfaces, trophies, pens, and such. I can also see a use in slicing acrylic tubing to perfect heights, with polished edges. If you had a small ham, and you moved the x-axis, while the ham spun on the forth-axis, you could cut your own spiral sliced ham. Let your imagination roam. You have to play with all these factors, till the cows come home. Move one and it affects another. Good Luck! It does work out in the end. I hope you enjoyed this so far. There are more articles to follow, about cutting specific materials, with a lot of detailed information about acrylic. All text and images associated with this article are copyrighted by Mosaical Memories 1/14/2001. However, all designs, ideas, concepts, patterns, and associated drawing files, unless otherwise noted are here by released to Public Domain. I would go as far, as to say that if you advance these ideas, you can cite this article, as a reference in your patent. Of course with any patent search, you may find that some ideas are already patented! Good Luck. Inlay Product World is largest supplier of stock and custom wood inlay strips, marquetry medallions, and all sorts of related items.